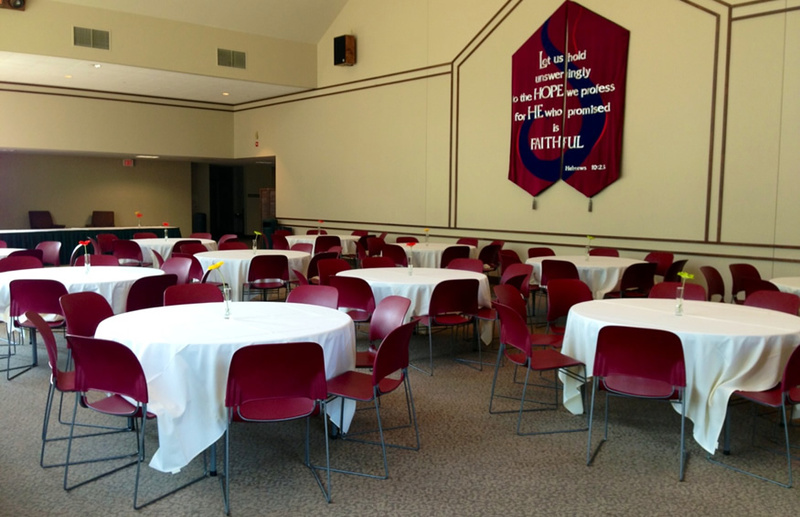 Trinity’s beautiful campus, located in Palos Heights, IL, just a short drive from downtown Chicago, offers a variety of ideal venues for your meeting, conference, wedding, worship service, or family gathering. Each space is equipped to meet your unique needs, and the professional, friendly staff offers the highest level of attention to detail and hospitality to you and your guests. 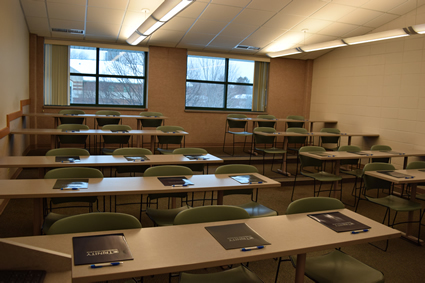 Trinity Christian College’s campus offers a variety of conference spaces that can be personalized to meet your specific business goals. Available spaces include classrooms, both large and intimate gathering spaces, and dormitory guest housing. 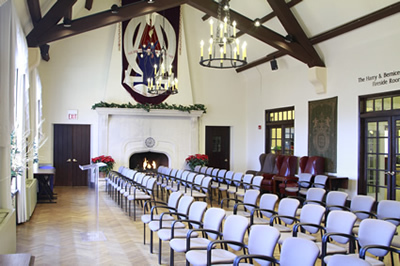 Trinity’s Ozinga Chapel Grand Lobby and Van Namen Recital Hall offer gorgeous settings for your big day. Host both your reception and ceremony right on campus, and enjoy the rest of campus for photos. 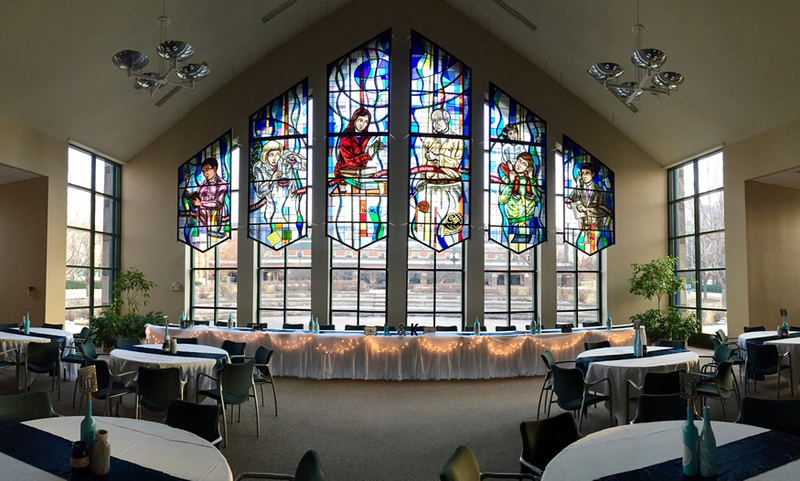 It’s an awesome space for a wedding at any time of year—especially if one or both of you are Trinity alumni! 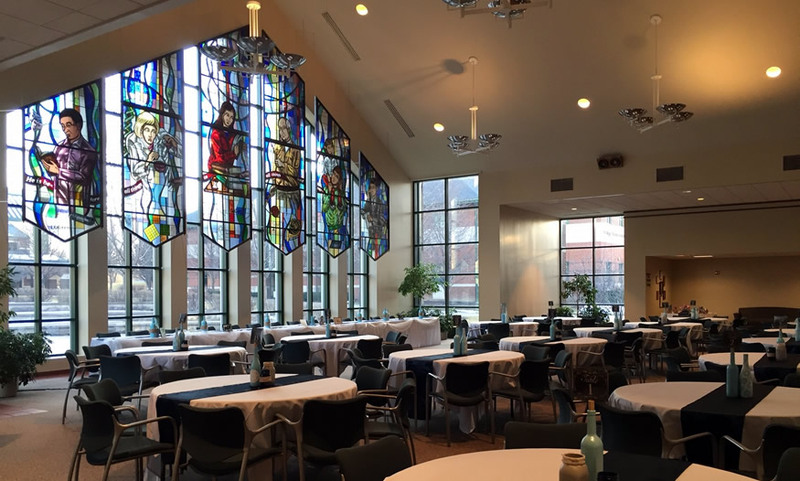 Trinity is a popular place to host a wide variety of social events, including reunions, anniversaries, holiday parties, wedding or baby showers, and birthday parties. Our capable staff will make sure your event runs smoothly so you can concentrate on celebrating your special occasion. Bring your church family together by hosting your church or youth retreat on Trinity Christian College’s versatile campus. 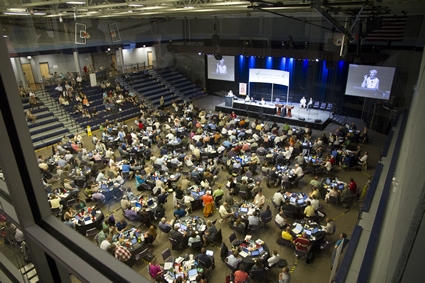 We provide a variety of spaces suitable for worship, plenary sessions, special meals, group activities, speaking events, and breakout sessions. Our residence halls are available to house your group from early May-July. 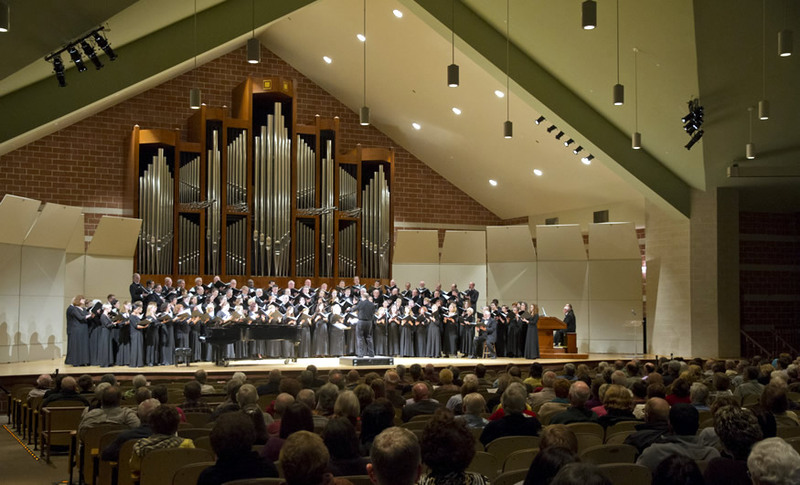 The Ozinga Chapel offers a perfect space for concerts and worship including an auditorium, choral room, and a recital hall. Our auditorium is well suited for large choirs, bands, and small orchestras. 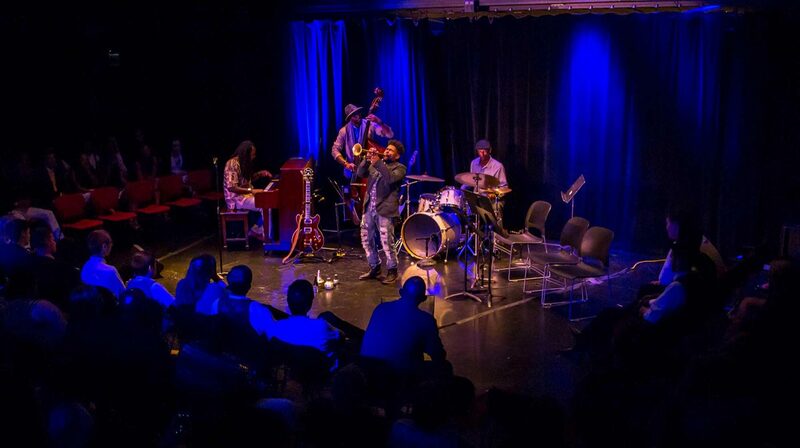 The Van Namen Recital Hall is equipped for intimate recitals and vocal performances. Lodging and catering services are available and can be tailored exactly to your needs. Learn more about these services, as well as policies, regulations, and parking below. From early May through July, Trinity Christian College’s three residence halls are available to guests for short term housing. With a total of 118 suites, our residence halls can house up to 444 persons. Most suites house four, and all suites have an attached bathroom. The dorms feature extra-long twin beds, desks, and dressers. Your suite will be equipped with basic linens and a bar of soap, so please plan to bring toiletries along. Please note that beds are not pre-made. Trinity’s lodging facilities are occupied by students from August through April, with the exception of 4 suites available for rental year round. The hospitable culinary team here at Trinity provides delicious menu selections for breakfast, lunch, and dinner. Creative Dining Services offers customized menus to fit specific events or special needs upon request. Creative Dining is the College’s exclusive food service provider. No other food, donated, catered or purchased by the group, may be brought onto campus for group use. Breakfast, lunch, and dinner may be purchased ‘through the line’ (cash and check only) in our dining hall or catered according to your needs. The Conference and Events Manager can help you plan for your dining needs. Snacks and coffee breaks may be arranged through the Conference and Events Manager as well. A variety of hot and cold drinks, cookies and snacks are available to meet the needs of your group. Guests are also welcome to walk over to the Bootsma Bookstore Café for coffee, soda, refreshments or lunch. The café accepts cash, check and credit cards. We try to plan your event so that there will be little or no food left. Please remember, however, that because of health regulations, leftovers may not be taken from the catered event. Alcohol is prohibited. Trinity Christian College, a Reformed Christian institution, by custom and conviction does not allow the consumption of alcohol, use of illegal drugs, or any other activity which the College deems inconsistent with its mission, in campus buildings and facilities, or on its properties. We look forward to hosting your event. All approved events must follow the following policies and regulations. Thank you for your consideration. Reservations will not be accepted for Sundays. Trinity Christian College (the College) programming shall take precedent over all community requests, except by Presidential permission. 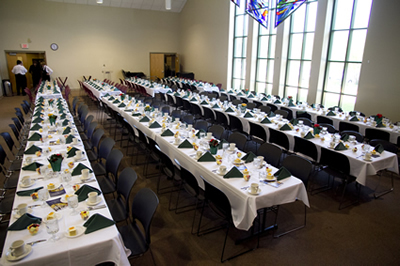 All community groups and organizations using facilities of the College must contract for all food service with the College’s dining service, Creative Dining. Trinity Christian College, a Reformed Christian institution, by custom and conviction does not allow the consumption of alcohol, use of illegal drugs, or any other activity which the College deems inconsistent with its mission, in campus buildings and facilities, or on its properties. Smoking is not permitted inside campus buildings. Campus visitors are permitted to smoke in the provided facility on the east of Lot C.
The client organization will be responsible for restitution of all damages to the College’s property inflicted by their group. Both willful and accidental damages will be assessed and brought to the attention of the Conference & Events Coordinator. The Conference & Events Manager will report information concerning location, approximate time and participants in any damage when possible, as well as actual repair/replacement costs. The College reserves the right to enter any room for the purpose of inspection, repair, or emergency. The College may also reassign residents within a residence hall after timely notifications, in order to accomplish necessary repairs. Bubble/smoke machines, glitter, chalk or other such items that may cause damage to the interior/exterior of the building are not permitted. The client organization shall pay the College a deposit to confirm the initial reservation, due upon return of signed contract. Deposits are fully-refundable up to 90 days prior to the event date. 50% of the deposit will be refunded up to 60 days prior to the event date. Deposits are non-refundable 30 days prior to the event. Tables and chairs may not be moved from any other location on campus. Soft seating furniture must remain in the lobbies of all buildings (administrative, academics, residence halls). Please make the Conference and Events Manager aware of any special needs your group may have. We will work to ensure all accessibility needs are met. When staying in the College’s residence halls, the client organization assumes the responsibility for rooms and their contents. The College is not responsible for loss or damage to personal property. The client organization shall maintain liability insurance as stated in the contract, throughout the duration of your group’s stay at the College. The client organization agrees to provide the College with a copy of the Internal Revenue Service Exemption Letter or registration form from the state indicating that the organization is incorporated as a non-profit organization. Please note that a federal identification number is not sufficient proof. In the interest of safety and sanitation, pets, other than those required for handicapped assistance, are not permitted in the residence halls or other campus buildings. 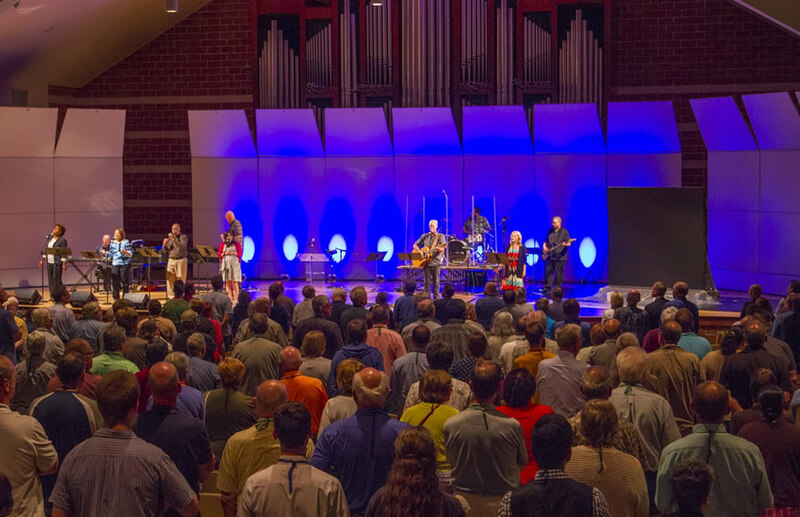 We encourage you or a representative from your group to visit campus prior to your conference for a pre-conference meeting. You can see the facilities and have any questions answered at that time. Any printed material that mentions Trinity Christian College must be approved in advance of publication by the Marketing and Communications department (708.239.4831). All signs must be approved by the Conference and Events Manager prior to posting. No object or sign may be attached to the walls with tape, nails, or screws. Maintenance services will hang any approved banners or signs. Blue painter’s tape is the only type of tape that can be used on the College’s surfaces. Nothing may be affixed to the walls of the Ozinga Chapel. Parking is free for campus guests. Vehicles must be parked in designated lots. Limited ADA approved handicapped parking is located in Lot E (Ozinga Chapel), Lot H (DeVos Gymnasium), Lot C (administrative building), and Lot A (dining hall). Trinity Christian College’s Safety and Security Office is on duty 24 hours; call 708.239.3722 to report any security assistance that is needed (emergency and non-emergency). The security staff will contact the proper city authorities and will provide assistance. Officers are trained and prepared to assist in situations including emergencies, first aid, stranded motorists, and room let-ins. To be escorted to an on-campus destination by a security officer, call 708.239.3722 or using a campus phone, dial 3722.